At last the final piece of furniture for our Dining Room Makeover is finished. Unfortunately or rather, fortunately, when we could only find four chairs for the table. 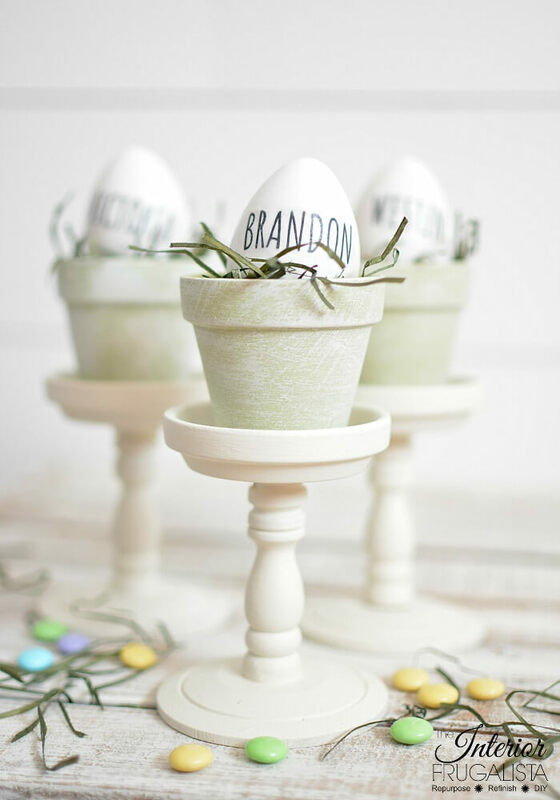 We had to come up with a way to incorporate two more to suit our growing family's needs. 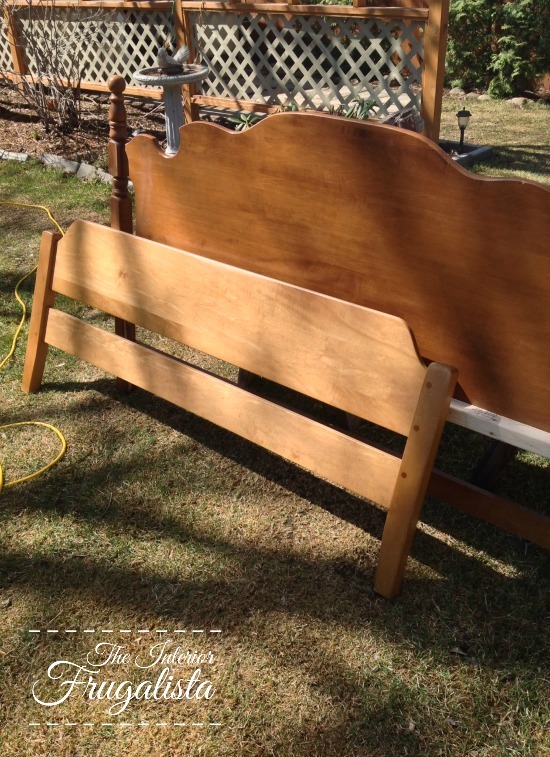 Last year we purchased a few headboards and footboards, none of which were matching sets, with the intention of turning them into outdoor garden benches. 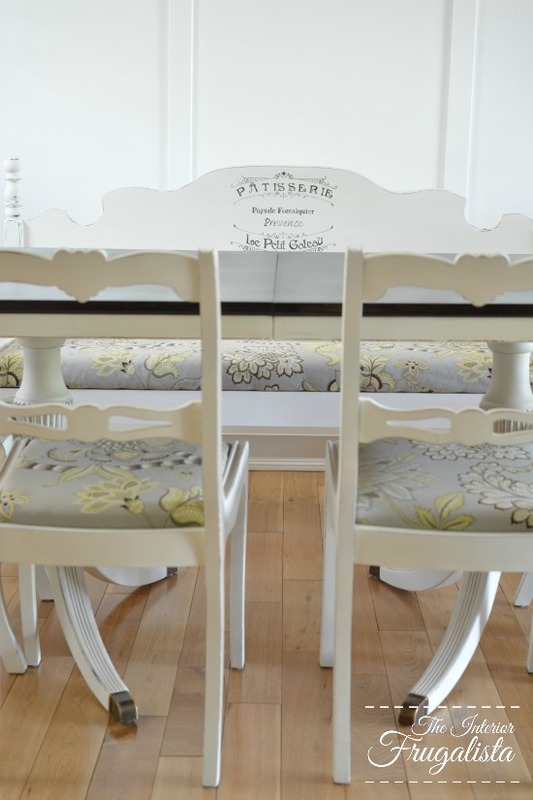 Then I got to thinking, instead of two mismatched chairs why not turn one of those Headboards Into A Farmhouse Dining Bench. When I saw the headboard I knew it would make such a lovely back on a bench. Sorry I forgot - ahem - we were arguing so much about how each of us thought a bench should be properly done, I didn't get pictures during the building process. I did manage to take one photo between arguments so I'll try my best to explain how we built it below. 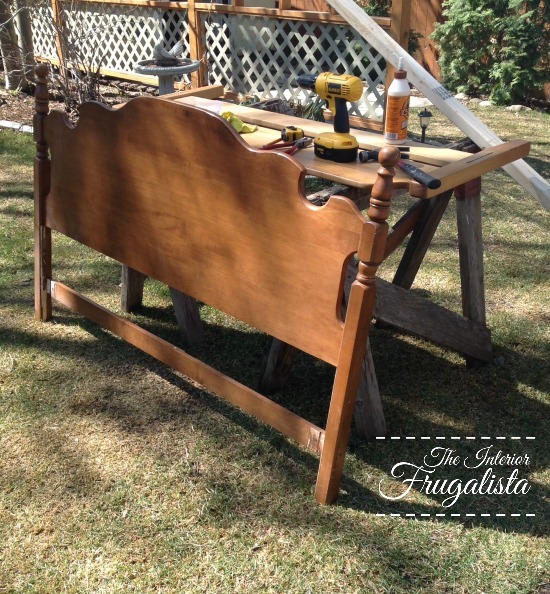 I caved and went with Mr. Frugalista's method of how to build a headboard bench. We sliced the footboard in half on the table saw and then determined the depth of the bench and cut more off to accommodate that depth. We established the height of the seat and attached a piece of 2 x 3 lumber onto the headboard from the back to support the seat. We drilled pilot holes into the headboard posts where the footboard pieces would be attached. 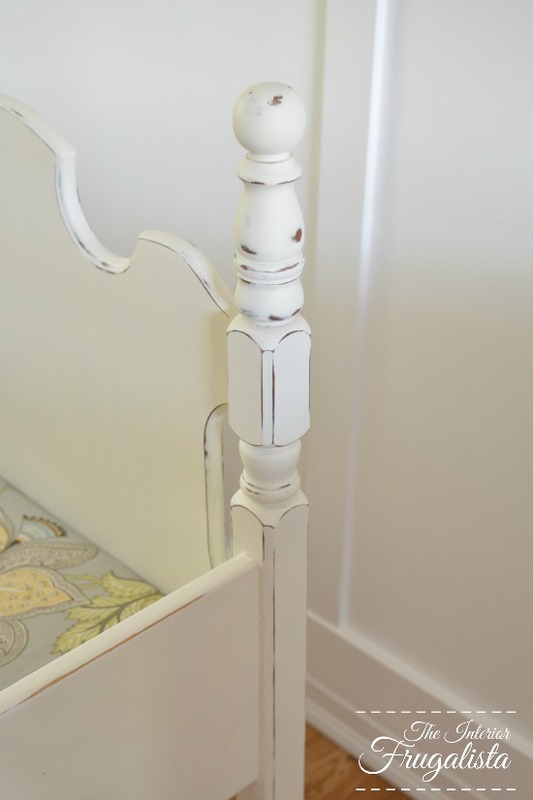 They footboard sides were screwed onto the headboard post from the back. Again using 2 x 3 lumber we essentially continued the seat support on each side, making sure it was square and level with the back support. Note: clamps are an essential tool during this step. Once we had our base supports secured, a sheet of plywood was cut to fit the seat. Note: it was not attached to the bench at this point. We will get to that step later in this post. If you want to see MY (the better way) of building a headboard bench check the full tutorial here in my post, Outdoor Garden Bench For Two. If you need more inspiration we also built this Art Deco Headboard Bench with leather hide seat. 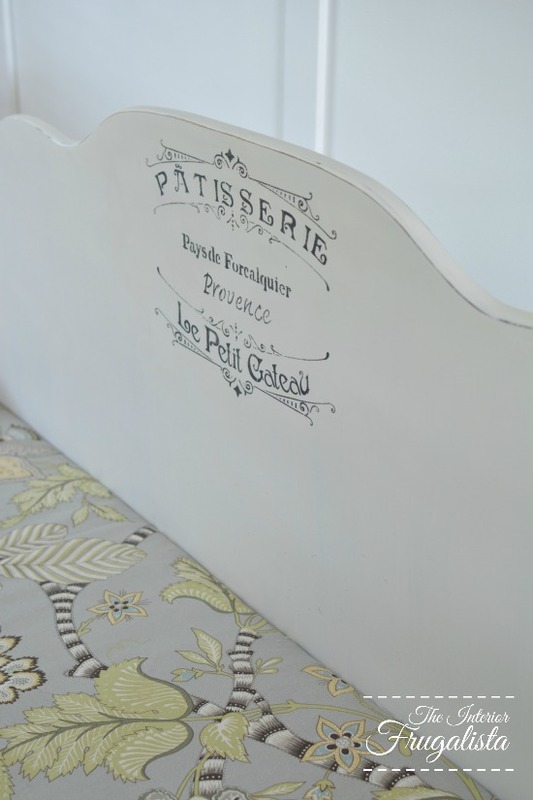 The bench was painted with a 50:50 ratio of Old White and Pure White Annie Sloan Chalk Paint™ and rolled on with a 6-inch foam brush for a smooth finish. But also to make the job go quicker. It took three coats to hide the dark wood underneath. 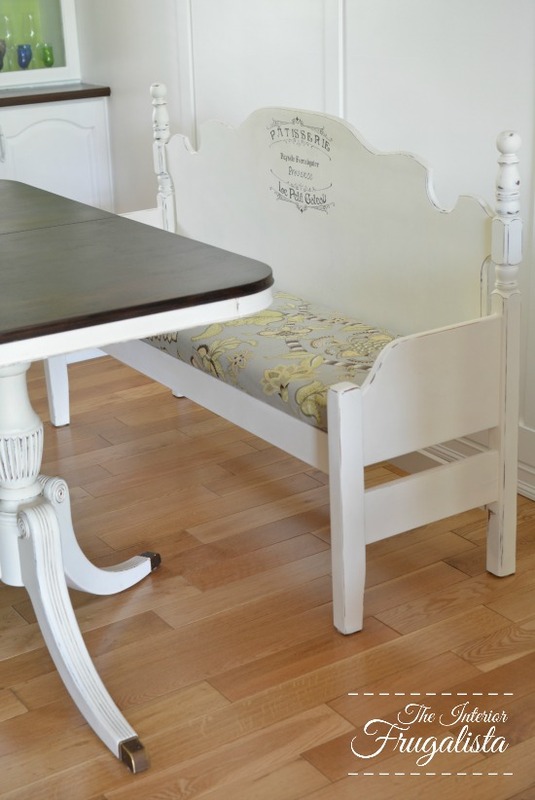 Once the paint was dry I distressed the bench using 80-grit sandpaper. The paint was protected with a coat of clear wax. To make buffing the wax much quicker and easier use a buffing wheel bit on a power drill (used for polishing wax on cars) works like a dream. I normally hand paint graphics onto my furniture pieces but when I found this fabulous stencil at Michael's, it was a no-brainer. 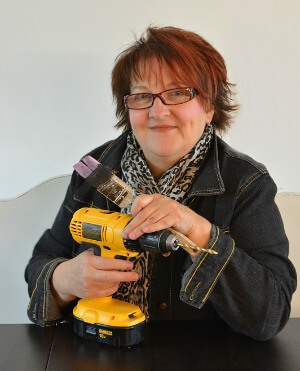 I stenciled the graphic using the color Graphite also by Annie Sloan Chalk Paint™. I would normally apply the stencil centered both vertically and horizontally but with the bench being behind our dining table, it would be hidden. Instead, I applied the stencil towards the top. Remember that piece of plywood we cut for the bench? Now it's time to glue a piece of 2-inch high-density foam onto it with spray adhesive. Wrap batting over the foam and onto the bottom of the plywood and staple in place. Next, we used the same fabric from our Duncan Phyfe Chairs to upholster the seat. 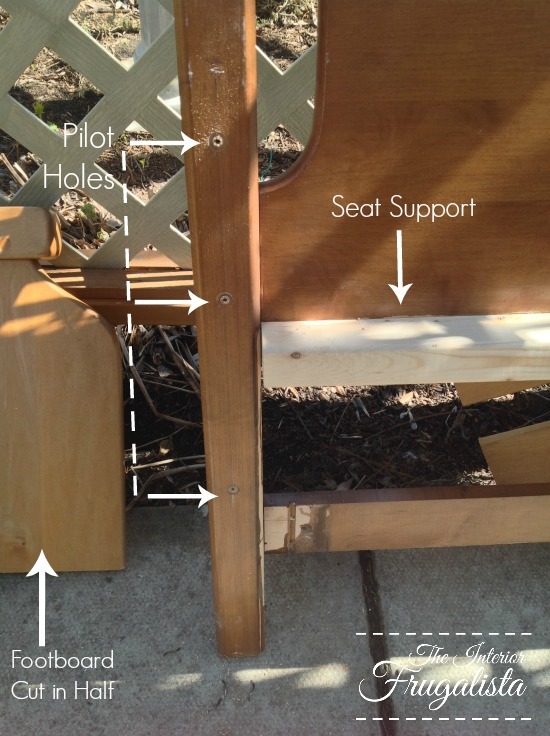 The last step is securing the now upholstered plywood onto the frame with screws, from the bottom of the bench up. Rather than two chairs, we can now seat three people comfortably on this bench. I love how the fabric picks up the dark brown on the stained table top. 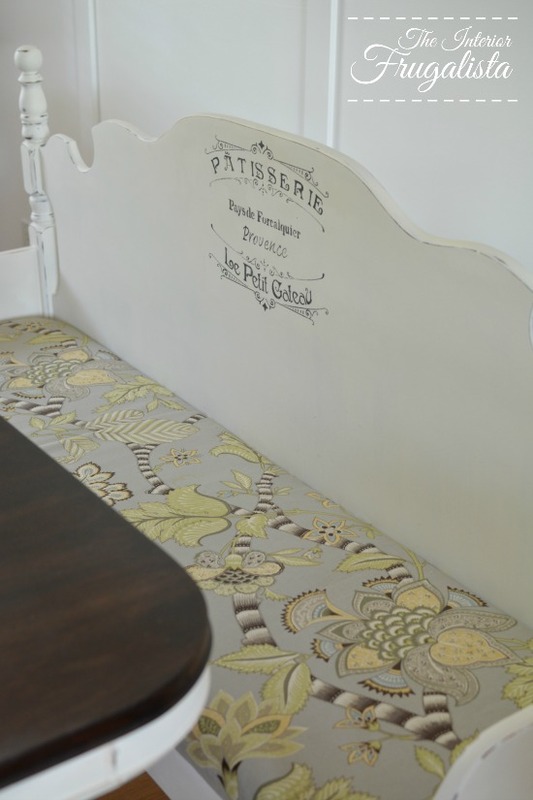 I couldn't be more thrilled with our Farmhouse Headboard Dining Bench. 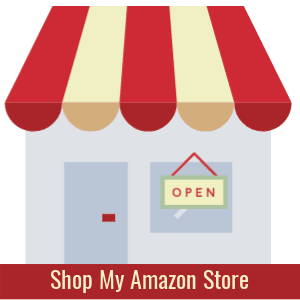 If you like it too, please share it with a friend and/or save it on Pinterest. I had some extra fabric leftover and so I made a table runner and a couple of pillows for the adjacent living room sofa (not shown). 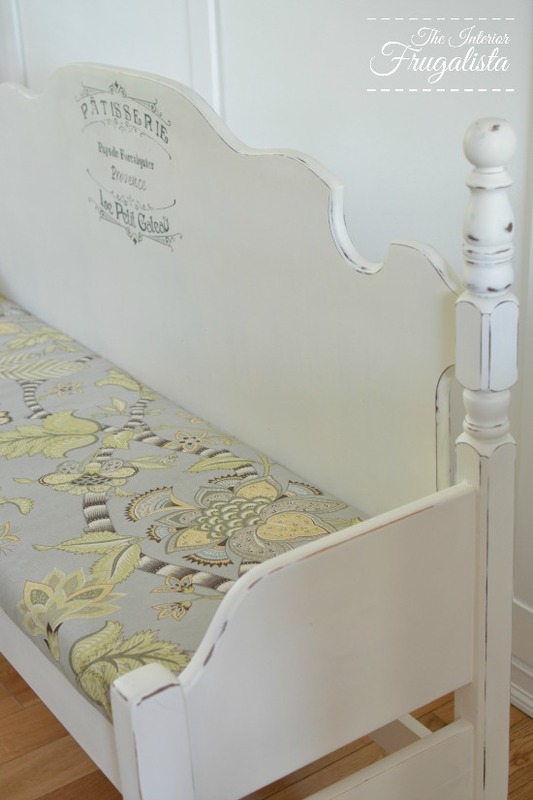 There are so many ways to transform headboards into benches and here is a couple more we made that you may find inspiring. 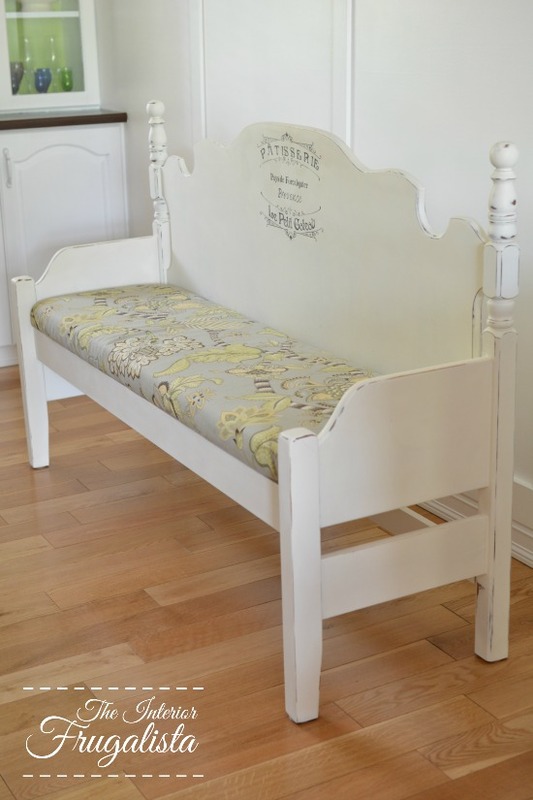 Twin Captain's Bed Bench and From Headboard To Entry Bench. Here is a link to the makeover post of the Duncan Phyfe Dining Table if you want to take a closer look. I hope our thrift store Farmhouse Headboard Dining Bench has inspired you to rethink those headboards you see piled up in the corner of your neighborhood thrift store.